In this contemporary world, urbanization leads to the development of various industries on an immense scale. Although rapid industrialization symbolizes the growth of any nation, it can impinge on the general as well as the oral health of their employees. Occupation is major source in the emergence of a variety of health problems due to anxious working schedule such as night shifts and stressed environment. As we all know that oral health is deep-seated part of health and reflects the mirror image of general health, oral cavity acts to take a one-step forward for the passage of various diseases. A study conducted by Sudhanshu et al. also showed the association between occupational exposure and greater incidence of oral diseases. Oral health is always an enduring part of wide-ranging health, and several studies in the past have revealed an association between socioeconomic factors and oral health.,,,,, Dental caries was pertinently afflicted by modernization and socioeconomic status (SES). Therefore, occupational- and stress-related oral diseases are very common in industrial workers and primarily related to SES. General Engineering Industry (GEI) is one of the renowned industries of Bhopal city. Thus, the assessment of oral health status of these recruits will also provide future opportunity to assess the influence of socioeconomic factors on their oral health, and this was a pioneer attempt to assess the impact of SES on decayed teeth (DT), filled teeth (FT), and missing teeth (MT) among industrial employees of Bhopal city. Moreover, this study will also help provide the baseline data for strategically planning and formulation to deliver the better oral health promotive, curative, evaluative, and rehabilitative care. All permanent industrial employees working since 3 years was included in the study. Employees who were reluctant to participate and absent during study period was excluded. After setting if inclusion and exclusion criteria total sample size was 448. The principled sanction was obtained from the Ethics Committee of the People's Dental Academy, Bhopal. A pilot study was accomplished along with thirty recruits to ensure the preferred viability with the modified WHO-2013 pro forma. According to the age group, GEI employees ranged in strata of 18–35, 36–55, >56, and 36–55 years. Whereas, according to SES, employees ranged in upper-middle class, lower-middle class, and upper-lower class. A qualified solitary investigator calibrated regarding interpretation, understanding, and application of codes and criteria in the modified WHO-2013 pro forma. A recording clerk was also trained to enter the data. The statistical analysis was done by using Statistical Package of Social Science (SPSS Version 20; Chicago Inc., USA). The Chi-square and analysis of variance were used to calculate the data; P < 0.05 was considered statistically significant. A total 448 industrial recruits were examine, ranging in a strata of 18-65 years. The majority of industrial recruits were 36–55 years of age group and appear under lower-middle class of SES. Statically highly significant difference was present in the demographic distribution of industrial employees (P = 0.001) [Table 1]. Oral hygiene practices of industrial recruits revealed that 90.6% of industrial recruits used toothbrush and 98.7% used toothpaste to clean their teeth. 74.1% of employees brushed their teeth once a day, while 36.6% changed their toothbrush in every 4–6 months. 40.6% of employees used toothpick/stick as interdental cleaning aids. 43.8% of employees rarely consumed sugar and their products. Statistically highly significant difference was present in brushing frequency in a day, frequency to change toothbrush and other cleaning aids used by different SES of industrial recruits (P = 0.001) [Table 2]. The mean DT, MT, FT, and decayed, missing, and filled teeth (DMFT) (dental caries experience) and dental caries prevalence of industrial recruits showed that the mean number of DT (1.34 ± 1.62) was higher among upper-lower class of SES. The mean number of MT (0.62 ± 1.19) was higher among lower-middle class of SES. The mean number of FT (0.54 ± 0.85) and DMFT (2.19 ± 1.92) was higher among upper-middle of SES. Statistically highly significant difference was present in FT (P = 0.001). 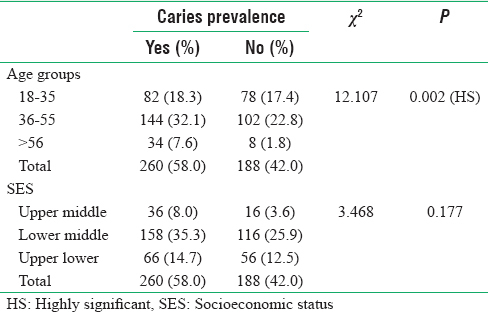 Dental caries prevalence of industrial recruits was 58.0% and more in lower-middle class of SES [Table 3] and [Table 4]. A descriptive cross-sectional study was conducted among 448 GEI industrial recruits of Bhopal city, to assess the impact of SES on DMFT. In the present study, recruits of GEI ranged in a strata from 18–35, 36–55, and >56 years of age group and upper-middle, lower-middle, and upper-lower class of SES. Demographically, industrial employees were abundantly in 36–55 years of age group and lower-middle class of SES. 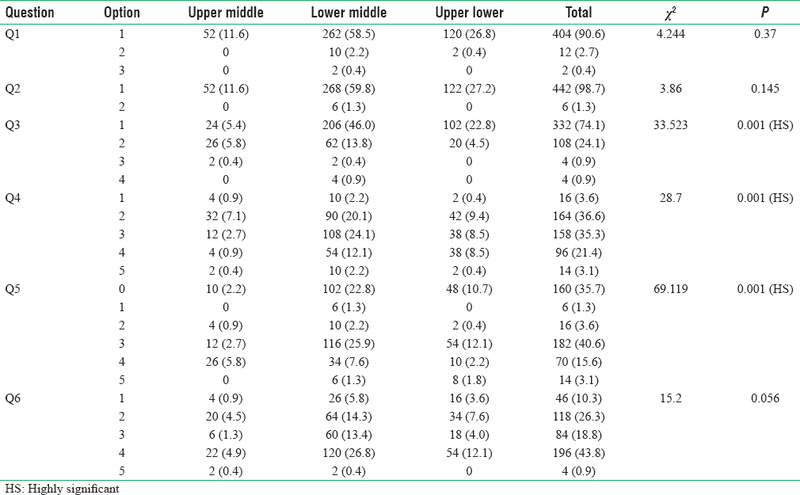 In this study, we found that the mean number of DT or untreated dental caries was more in upper-lower class as compared to lower-middle and upper-middle class. This was probably due to their poor oral hygiene practices, lack of awareness, and poor utilization of dental services. Similar results were found by Chandra Shekar and Reddy; they found that the mean number of untreated dental caries was higher (0.96 ± 2.06) among lower SES. In the current study, we found that the mean number of MT due to dental caries was higher among lower-middle class of SES. Although lower-middle class was quite satisfactorily educated, the rationale of high number of MT possibly was due to the costly replacement of MT or lack of motivation and awareness on provision of reimbursement for dental care. Therefore, lower-middle class of SES prefers to extract their teeth as a part of dental treatment, rather than emphasized on curative or rehabilitative treatment. In this study, we found that the mean number of FT was high among upper-middle class of SES. Chandra Shekar and Reddy  originated similar results; they also found that the mean number of FT (1.52 ± 2.13) was higher among upper class of SES. This may be because upper class has good oral hygiene practices, high awareness, and excellent utilization of dental services and most importantly positive perception of the fact that the teeth are worth saving. On the contrast of this, the mean DMFT was also higher among upper-middle class; this may be because of the dietary habits of upper-middle class people such as consumption of soft drinks, processed foods, and sticky foods. A research also revealed that the dental caries is lifestyle related disease. Prevalence of dental caries was increase by using soft drinks and sticky foods. Therefore, the overall result of this study gives an emphasis on oral health education, promotion, and privileged preventive as well as curative and rehabilitative treatment requirements among lower as well as upper SES. 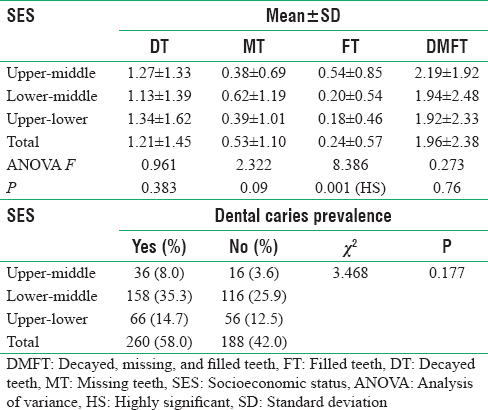 This study concluded that dental caries prevalence is not remarkably exaggerated by SES, but the mean number of DT, FT, and MT is unswervingly allied with SES. Dentition status of industrial recruits was not up to the standard level, especially in the lower class. Therefore, to reduce the disparity of oral health, equitable distribution of services among different SESs is important. Efforts needed to be taken for provision and utilization of more promotive, preventive, and curative dental services to meet the unmet dental necessities of industrial employees. To reduce the disparity of oral health services among different SESs, every industrial premise has their own well-equipped dental as well as general hospital. A comprehensive treatment facility should be provided for all industrial employees in their premises, to elevate their oral health profile which also improves respond to people's justifiable demands with a fairness in economics. The authors would like to thank all the study participants for their kind cooperation throughout the study. Sudhanshu S, Pankaj A, Sorabh J, Nidhi S. Dental diseases of acid factory workers globally-narrative review article. Iran J Public Health 2014;43:1-5. Stansfeld S, Head J, Marmot M. Work Related Factors and Ill Health: The Whitehall II Study. Norwich: Health and Safety Executive; 2000. Pickering TG. The effects of environmental and lifestyle factors on blood pressure and the intermediary role of the sympathetic nervous system. J Hum Hypertens 1997;11 Suppl 1:S9-18. Abegg C, Marcenes W, Croucher R, Sheiham A. The relationship between tooth cleaning behaviour and flexibility of working time schedule. J Clin Periodontol 1999;26:448-52. Matthews KA, Gallo LC, Taylor SE. Are psychosocial factors mediators of socioeconomic status and health connections? A progress report and blueprint for the future. Ann N Y Acad Sci 2010;1186:146-73.
da Silva SR, Castellanos Fernandes RA. Self-perception of oral health status by the elderly. Rev Saude Publica 2001;35:349-55. Breivik T, Thrane PS, Murison R, Gjermo P. Emotional stress effects on immunity, gingivitis and periodontitis. Eur J Oral Sci 1996;104:327-34. Aurer A, Aurer-Kozelj J, Stavljenić-Rukavina A, Kalenić S, Ivić-Kardum M, Haban V, et al. Inflammatory mediators in saliva of patients with rapidly progressive periodontitis during war stress induced incidence increase. Coll Antropol 1999;23:117-24. Petridou E, Athanassouli T, Panagopoulos H, Revinthi K. Sociodemographic and dietary factors in relation to dental health among Greek adolescents. Community Dent Oral Epidemiol 1996;24:307-11. Freire Mdo C, de Melo RB, Almeida e Silva S. Dental caries prevalence in relation to socioeconomic status of nursery school children in Goiânia-GO, Brazil. Community Dent Oral Epidemiol 1996;24:357-61. Whittle JG, Whittle KW. Household income in relation to dental health and dental health behaviours: The use of super profiles. Community Dent Health 1998;15:150-4. Al-Hosani E, Rugg-Gunn A. Combination of low parental educational attainment and high parental income related to high caries experience in pre-school children in Abu Dhabi. Community Dent Oral Epidemiol 1998;26:31-6. Jorgensen EB. Effect of socio-economic and general health status on periodontal conditions in old age. J Clin Periodontol 2000;27:83. Finn. Text Book of Clinical Pedodontics. 4th ed. USA: W.B. Saunders Company; 1991. p. 470. Ravi Kumar BP. Kuppuswamy's socio-economic status scale – A revision of economic parameter for 2012. Int J Res Dev Health 2013;1:2-4. Chandra Shekar BR, Reddy C. Oral health status in relation to socioeconomic factors among the municipal employees of Mysore city. Indian J Dent Res 2011;22:410-8. Chopra A, Dhawan A, Seth H, Mohan D. Association between parental and offspring's alcohol use-population data from India. J Indian Assoc Child Adolesc Ment Health 2008;4:38-43.